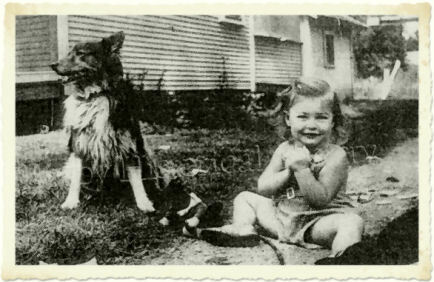 Martha, better known to the Bixby community as “Boo,” was the only child of Roger and Agnes (nee Wamsley) Plummer. She earned her nickname, “Boo,” as a small child who loved to play peek-a-boo. Boo grew up in the small community of Bixby with some of hr best and lifelong friends; Martha Sue Burris, Awilda Neas, Joan Wetzel and Barbara Brown. Boo attended Bixby schools where she participated in many activities from elementary school plays and operettas to high school social activities and leadership roles. At an early age, she became an avid reader which lead to chosen career as an accomplished journalist. In high school she was on the yearbook and newspaper staff. She was editor of the Bixby High School newspaper, The Spartan Spirit, during her senior year. 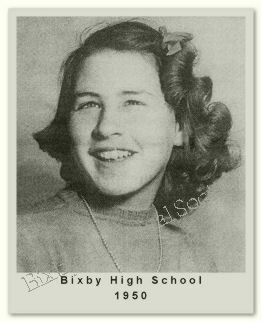 Boo was valedictorian of her 1950 graduating class at Bixby High School. After graduation she enrolled at the University of Oklahoma, majoring in journalism. At Oklahoma University she was editor of the campus newspaper, Oklahoma Daily. After graduating from OU she continued her journalistic venture as a reporter for the Tulsa Tribune. She later became a successful businesswoman, managing family real estate properties and oil & gas interests. She was an active member of Kappa Alpha Theta Sorority. She graduated Phi Beta Kappa and was recipient of the Gold Leitzer Award for academic achievement in 1954. After graduation, she remained an avid crimson and cream sports fan throughout her lifetime. One quickly learned never to call her during an OU game. Martha married A. P. Roberts in 1958 and lived in Bixby for several years to allow their son a taste of growing up with the small town experience. Boo was generous with her time, talents and treasures. She participated in a wide variety of civic organizations, including the preservation of history and nature. She was active in organizations that concentrated upon helping children and youth. She served as an officer in Junior League of Tulsa, a supporter of Philbrook Art Museum and Gilcrease Museum. 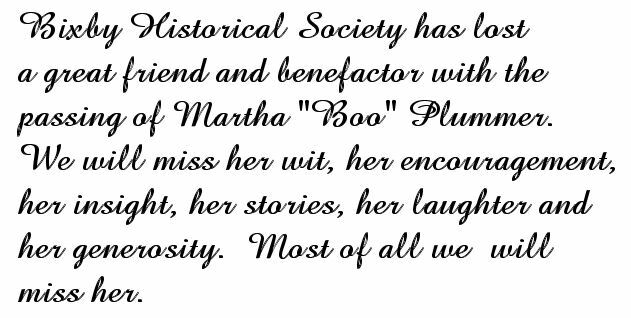 She was board member of the Tulsa Historical Society and Friends of Washington Irving Park. She was involved with helping provide educational opportunities for students through the Oklahoma Foundation for Excellence, the OU Foundation and Bixby Education Endowment Fund. The Roberts’ were instrumental in helping establish Bixby Historical Society Museum by donating land and buildings for the museum complex. In 2005, Boo was one of the first to step forward with financial help for Bixby Historical Society book project, A History of the Bixby Area, Centennial Edition. She encouraged others to participate by contributing family histories. During the closing years of her life, she became a grandmother when her son and daughter-in-law presented her with a granddaughter. Boo playing at her grandparents’ farm in Bixby, about 1935. This article first appeared in the 2008 Spring issue of the Bixby Historical Society Newsletter. It is modified, here, to exclude information about living persons.